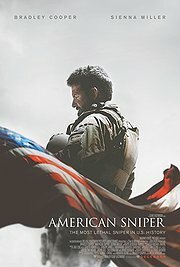 It has been discussed and people have been shouting at each other – the summary would be that American Sniper is unable to convey what its message is. Audiences are uncertain whether they should be angry at the film’s message or at Clint Eastwood for being unable to make that message clear. Here is my interpretation: I think there is a disgusting fetish for people who are good at killing other people. This is a mass phenomenon among some groups of society, and in particular maybe in the US, a country with a history of gun ownership, a history of pro-militarism and a history of longing for heroes. Maybe Eastwood saw the story of a sniper’s life and realised that this story illustrates many ill-conceived concepts of heroism. There is somebody who kills a record number of people, and instead of questioning why this was necessary and discuss the terrible cost some people have to pay for playing an important role, he becomes some sort of celebrity for it, a hero in certain groups, and – it seems – never encourages those who celebrate him to question this enthusiasm, as it is enthusiasm for inflicting death. If your attitude towards violence and war is one of “unenthusiastic appreciation of occasional necessity”, then watching the American Sniper go on one tour after the other to Iraq makes you sick. He goes and calls it his duty, but truth seems rather to be that it is the only thing he is good at and where he feels at peace. You would want to sympathise with his wife, only that the movie leaves so little space for her that there is no way of feeling empathy. You would want to hear about the doubts he has and how he is torn between his duty and his humanity, but he does not express this doubt. What is actually most interesting (and the reason why in the end I believe that Eastwood did create the right film rather than the wrong one) is that this Seal team member is maybe not a hero in his own film. His only positive attribute is his ability to shoot and kill people. He is actively supressing any form of emotion, carries a big macho monkey on his back, does never admit that he is upset or unhappy (or happy for that matter). When he happens to stumble into a doctor who takes his blood pressure, the display shows that this guy is permanently on the verge of exploding, pushing away everything to stay hidden behind his façade. Eastwood, I think, is not celebrating a mass murderer (even though there are others who believe that he does), but he is criticising stupid and simple macho attitude, male inability to commit to a family and he also criticises the American (military and civilian) public for making that guy a hero. I hope I am right with this interpretation, because otherwise I have seen a terrible terrible film.